On The Undefeated: Interviews with Black Actors who played “token” characters on television in the 1990’s, from “Seinfeld” to “Dawson’s Creek.” Important, moving, and infuriating. n the 1990s, the wealth of black representation on television could lull you into thinking (if you turned the channel from Rodney King taking more than 50 blows from Los Angeles Police Department batons) that black lives actually did matter. But almost all of these shows were, in varying ways, an extension of segregated America. It’s there in the memories of the stars below: There were “black shows” and there were “white shows.” If you were a black actor appearing on a white show, you were usually alone. For some of the most visible black actors coming of age in the 1990s, it’s clear that along with the triumphs came isolation, blatant racial stereotyping and biased casting calls. As for “crossing over” to the mainstream, in the mostly segregated worlds of Seinfeld, Frasier, Melrose Place, Saved by the Bell: The New Class, Felicity, V.I.P., Buffy the Vampire Slayer, Dawson’s Creek and more, blacks were usually relegated to bit parts or were there for a short time. The Undefeated sat down with eight of these talented women and men. These are their stories. This is history. Next PostNext Easter DVD Prize Pack! Veggie Tales, Ice Age, and Peppa Pig! When you’re privileged, “Your life is so carefree, you start wondering why other people don’t just help themselves. Because you think life is just as easy for everyone else.” But Mindy misses being interesting and different, so she wishes to go back to being an Indian woman. Plus, she gets to bond with Dr. Lee over fettuccine at the hospital. A perfect little lesson in privilege and allyship, wrapped in a sweet, sitcom form. 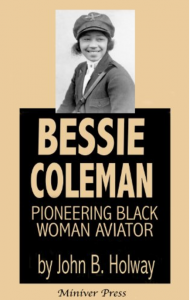 In honor of Black History Month — John Holway’s fascinating ebook about Bessie Coleman, the first place woman aviator, is FREE February 13-17, 2017. Enjoy! Back in the 1920s planes were made of wood and cloth held together with wire. And back then everyone knew blacks couldn’t fly, and neither could women. But this spunky black woman from the cotton fields of Texas did loops above the Eiffel Tower, walked on wings above America, and jumped off planes to the oohs and gasps of crowds. Bessie could also do a mean Charleston on the dance floor while guys lined up on both sides of the Atlantic. Her admirers included France’s top World War I ace, an African prince, a Florida millionaire, Chicago’s top black newspaperman, and its top black gangster. She survived broken bones and some broken hearts. 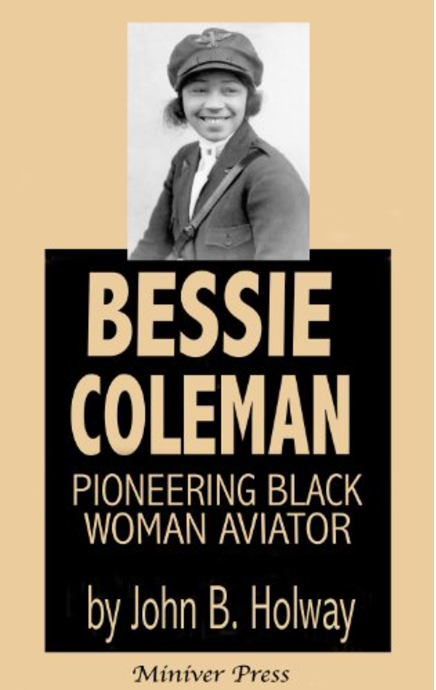 She was the first person, man or woman, to open the skies to black pilots. She helped open grandstands on the ground as well, refusing to perform unless everyone could buy a ticket. She inspired generations of flyers. After years of neglect, she has at last been recognized as one of the leading figures in aviation, African-American, and women’s history. Tributes include a postage stamp, a street named for her at O’Hare airport, and her photo tucked into a spacesuit worn by the first black woman astronaut as she flew on the space shuttle.